One of my absolute favorite parts of the book that is my Bible these days, talks about acceptance as being the answer to all of my problems today. I have read and re-read that section a number of times. I even took a screen shot of it and carry it around on my phone to pull out and read when I am having a particularly rough time. This is one of those times. When I start to feel uncomfortable, fearful, anxious, or worried, I have to look deep within to find the answers. The cause of these feelings cannot be found by looking outward. Yes, there might be someone or some situation that is upsetting me. However, if there is one thing I have learned, and learned the hard way, it is that I cannot change, control, or fix anyone or anything around me. People let us down sometimes. Things don’t go the way we planned. But there is absolutely nothing we can do over it. 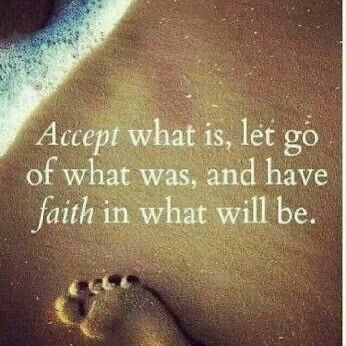 We must simply accept what is, let go of what was, and have faith in what will be. Sounds simple doesn’t it? Yeah, right!! It isn’t simple. But it is what we must do if we want to stay sober and live a life filled with joy. Life throws us curves, but it is how we react that matters. We can only control our own reactions to the things that happen around us. For me, the hard part of that saying is the third line… “Have faith in what will be”. It is sometimes easier to shake off a failed relationship and let go, but much more difficult to believe and have faith that all will be okay and better things are in store, even though I try. Wasn’t it Yoda from Star Wars that said, “Do. Or Do Not. There is No Try.”? I cannot try to have faith… I simply must. Because to not have faith will only lead me back to the life I want so desperately to never revisit. To be sober, physically and emotionally, I must have faith.